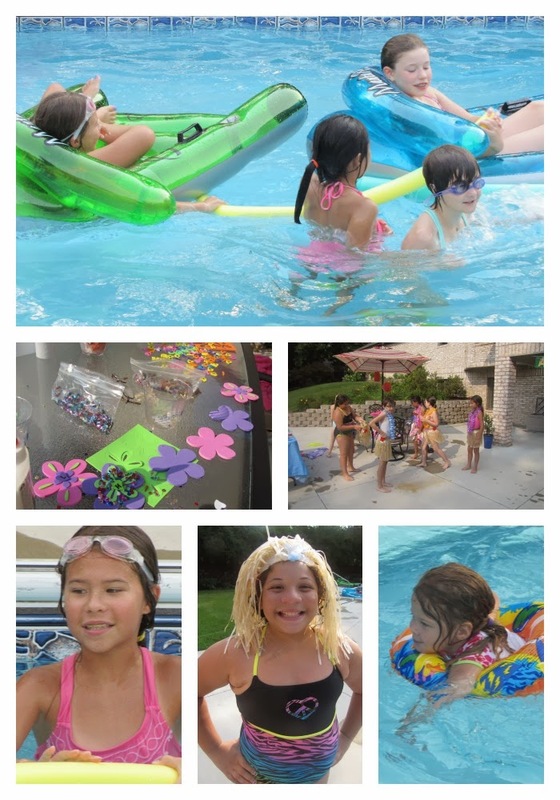 But when Natalie turned 10, she requested a luau party. I had thrown a luau for her before, when she was two. But she didn't remember it, of course, and she looks Hawaiian and her birthday is in July and we have a pool. So I relented. Just this once. And I'm glad I did. Hosting a luau in the middle of summer is incredibly easy. Almost every party store is well-stocked with tiki masks and plastic leis and grass skirts and Hawaiian print napkins at that time of year. I even found a faux fishing net on clearance and set it over a plastic blue tablecloth for that seaside look. 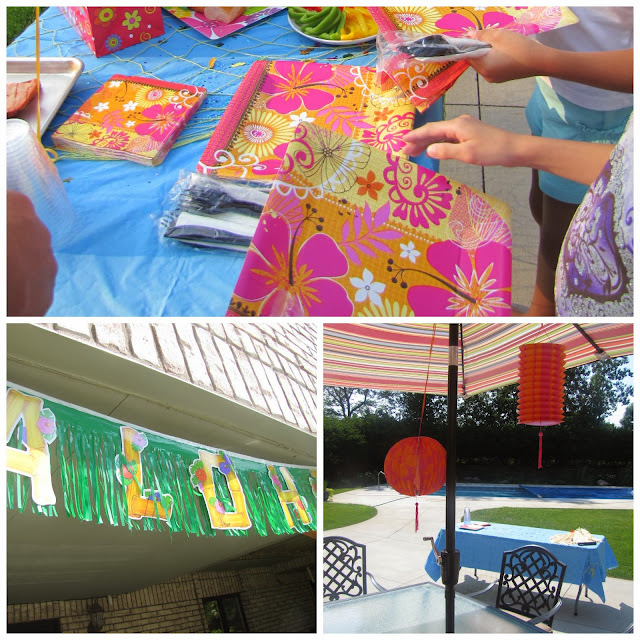 I also got out my birthday party bin, where I throw all my extra or undamaged party supplies, and dug out this aloha banner and those paper lanterns originally purchased for Natalie's two-year-old party. I also discovered an unopened bag of luau confetti and a container of tiny colorful shells. Take that as a universal birthday party tip, by the way: Have a place where you can stash extra streamers, balloons, unused napkins and plates, unneeded confetti, even helium balloon weights. You never know when you might use those again. I get my bin down every time I throw a party, and I almost always find a few things to reuse. If nothing else, you can use those old napkins in sack lunches; nothing makes a kid smile like finding a luau napkin tucked next to their ordinary PB&J. Because we have a pool, and Natalie loves to swim, we centered our luau around the water. But this could just as easily be done at a beach or a neighborhood pool. We also made foam leis, which the girls decorated with jewels and puffy paint. And since we gave a grass skirt and silk lei to each guest, we had an impromptu belly dance contest that ended in more giggles than gyrations. We figured our luau guests would be hungry after all that swimming, so for this party, we served more real food than might be customary. Natalie helped me put together ham-and-pineapple kebobs, served with a side of Trader Joe's Island Soyaki dipping sauce. (We discussed using Spam instead of ham, but decided there is such a thing as too much realism.) We cut up sliced bell peppers, because Natalie loves them. And put out a platter of Hawaiian buns, which may have disappeared before lunch was even served. We also served an amazing and colorful punch. I'll share that recipe tomorrow. Our cupcakes were mini beach scenes. We iced each cupcake with half blue buttercream, half white buttercream. The blue side got sprinkled with blue sugar (make your own, to save money); the white side was sprinkled with graham cracker crumbs, to look like sand. We used cocktail umbrellas, also discovered in the birthday bin, as jaunty beach umbrellas stuck into the shore, and a gum ball under the umbrella stood in for a beach ball.